Welcome to my Christmas daybook for these 12 days of celebrating. We'll be spending Christmastide with some favorite short films and video clips. Join me, won't you? Where you live, too? Even our friends in Austin got snow twice this winter already! This is the time to savor the beauty unique to cold and snow. While I have no aspirations to be a reindeer herder in Finland or a farmer helping cranes live through winter in cold Japan, I love knowing about those who do. I applaud their heartiness, and hope I can think about them instead of complaining about the cold. There is an austere beauty in the frigid, and these are just two small, amazing examples. 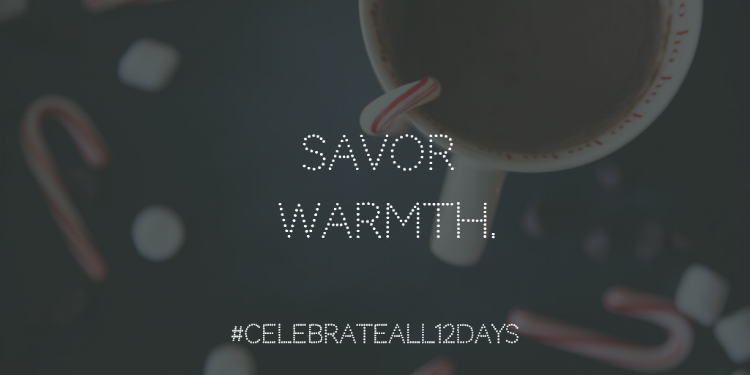 May you enjoy something cozy on this ninth day of Christmas, friends. I'm guessing many of you are back to work, maybe even school, today? Here's something to look forward to when you get back home snug and sound. We keep a hot cocoa "station" up throughout December and January (well, sometimes February, too!). During the early days of Christmastide we tend to enjoy all the special delicacies that the cocoa takes a back seat. Today's a good day to enjoy again the simple pleasure of a mug of hot cocoa and your favorite add-ons (marshmallows, whipped cream, candy canes, schnapps, etc.) Bonus points for all those who actually venture outside before enjoying the hot beverage.